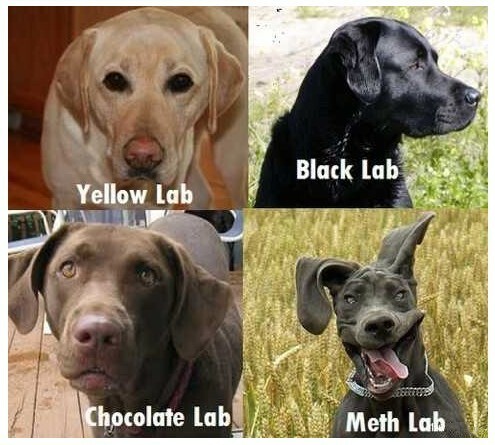 3 out of four dogs recommend you stay off drugs. Mud puddles are irresistible for kids, even kids with four legs. Check out this video of an elk calf frolicking in a mud puddle. Lots of splashes and kicks, but sadly no Chuck Norris roundhouse kicks. 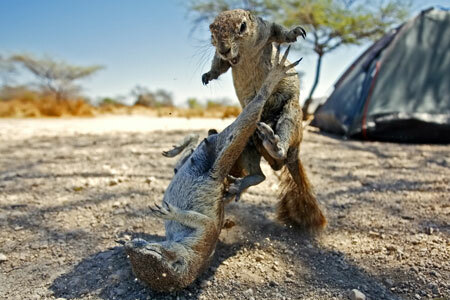 Nature photographer David Slater has come across a dojo family of very aggressive squirrels in Etosha National Park, Namibia. These members of my legion throw down with some nasty fu and fighting forms. Metro has the full story and more Fight Club pics. Here’s a little extra squirrel action for you. 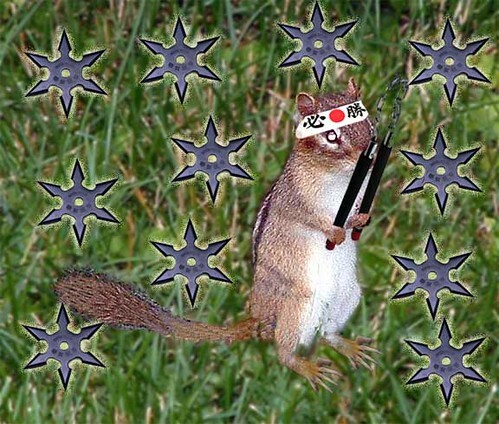 No stuffed real squirrels were harmed in the making of this video. 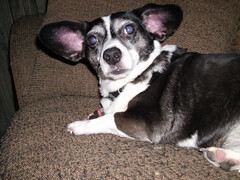 Maybe this dog was the inspiration for those Air Bud movies. Sadly, Mabel isn’t nearly this skilled in soccer, but she does play a mean game of field hockey. Although she objects a bit to the plaid skirts that are part of the uniform. For another cool dog video, check out man’s best friends welcoming him home from war. Here’s a little something to get you ready for the rat race today. Personally, I like the way the one cat just works out his front legs and keeps two feet planted firmly on the floor. It’s sort of a Casey Kasem “Keep your feet on the ground and keep reaching for the stars” sort of philosophy. How can you go wrong with that? If you want something a little more techno than this ditty to pump you up, check out the Shimmy Shake.